To setup EGit development environment, I followed "Automated Developer Setup" instructions on http://wiki.eclipse.org/EGit/Contributor_Guide#Automated_Developer_Setup. Selected "Latest (Oxygen)" for Product Version on Eclipse Installer. When I finished the instructions, the Problems view on Eclipse showed errors below. [Project]-[Clean...]-[Clean all projects] did not resolve these errors. 4. Then define the new baseline as the active one and do a full build. We'll fix the Oomph setup once EGit 4.8.0 has been released so that it'll then use the official 4.8.0 as API baseline out of the box. Thank you for your advice. I followed your instructions and all errors are resolved. The error "Invalid @since 4.8 tag on ~" had been resolved, but I got another error when right click on the "org.eclipse.egit.ui" project and select Debug As > Eclipse Application. Unresolved requirement: Require-Bundle: org.eclipse.ui.workbench.texteditor; bundle-version="[3.5.0,4.0.0)"
-> Bundle-SymbolicName: org.eclipse.ui.workbench.texteditor; bundle-version="3.10.1.v20160818-1626"; singleton:="true"
Unresolved requirement: Require-Bundle: org.eclipse.ui; bundle-version="[3.5.0,4.0.0)"
-> Bundle-SymbolicName: org.eclipse.ui; bundle-version="3.108.1.v20160929-1045"; singleton:="true"
Unresolved requirement: Require-Bundle: org.eclipse.ui.workbench; bundle-version="[3.105.0,4.0.0)"; visibility:="reexport"
-> Bundle-SymbolicName: org.eclipse.ui.workbench; bundle-version="3.108.3.v20170216-1539"; singleton:="true"
Unresolved requirement: Import-Package: javax.inject; version="1.0.0"
Unresolved requirement: Require-Bundle: org.eclipse.ui.forms; bundle-version="[3.2.0,4.0.0)"
-> Bundle-SymbolicName: org.eclipse.ui.forms; bundle-version="3.7.1.v20161220-1635"; singleton:="true"
Unresolved requirement: Require-Bundle: org.eclipse.e4.ui.css.core; bundle-version="0.10.100"
Unresolved requirement: Require-Bundle: org.eclipse.ui; bundle-version="[3.105.0,4.0.0)"; resolution:="optional"
Unresolved requirement: Require-Bundle: org.eclipse.ui.editors; bundle-version="[3.5.0,4.0.0)"
-> Bundle-SymbolicName: org.eclipse.ui.editors; bundle-version="3.10.1.v20161106-1856"; singleton:="true"
Unresolved requirement: Require-Bundle: org.eclipse.ui.ide; bundle-version="[3.5.0,4.0.0)"
-> Bundle-SymbolicName: org.eclipse.ui.ide; bundle-version="3.12.3.v20170119-0935"; singleton:="true"
Unresolved requirement: Require-Bundle: org.eclipse.ui; bundle-version="[3.106.0,4.0.0)"
Unresolved requirement: Require-Bundle: org.eclipse.ui.workbench; bundle-version="[3.7.0,4.0.0)"
Unresolved requirement: Require-Bundle: org.eclipse.ui.views; bundle-version="[3.2.0,4.0.0)"
-> Bundle-SymbolicName: org.eclipse.ui.views; bundle-version="3.8.102.v20170111-0801"; singleton:="true"
Unresolved requirement: Require-Bundle: org.eclipse.ui.ide; bundle-version="[3.3.0,4.0.0)"
Unresolved requirement: Require-Bundle: org.eclipse.ui.console; bundle-version="[3.5.300,4.0.0)"
-> Bundle-SymbolicName: org.eclipse.ui.console; bundle-version="3.6.201.v20161107-0337"; singleton:="true"
-> Export-Package: org.eclipse.ui.forms.widgets; bundle-symbolic-name="org.eclipse.ui.forms"; bundle-version="3.7.1.v20161220-1635"; version="0.0.0"
Unresolved requirement: Import-Package: org.eclipse.jgit.annotations; version="[4.9.0,4.10.0)"
-> Export-Package: org.eclipse.jgit.annotations; bundle-symbolic-name="org.eclipse.jgit"; bundle-version="4.9.0.qualifier"; version="4.9.0"
Unresolved requirement: Import-Package: com.googlecode.javaewah; version="[1.1.6,2.0.0)"
Unresolved requirement: Import-Package: org.eclipse.jgit.api; version="[4.9.0,4.10.0)"
-> Export-Package: org.eclipse.jgit.api; bundle-symbolic-name="org.eclipse.jgit"; bundle-version="4.9.0.qualifier"; version="4.9.0"; uses:="org.eclipse.jgit.revwalk,  org.eclipse.jgit.treewalk.filter,  org.eclipse.jgit.diff,  org.eclipse.jgit.util,  org.eclipse.jgit.notes,  org.eclipse.jgit.dircache,  org.eclipse.jgit.api.errors,  org.eclipse.jgit.lib,  org.eclipse.jgit.treewalk,  org.eclipse.jgit.blame,  org.eclipse.jgit.submodule,  org.eclipse.jgit.transport,  org.eclipse.jgit.merge"
Unresolved requirement: Require-Bundle: org.eclipse.mylyn.wikitext.core; bundle-version="[2.9.0,3.0.0)"; resolution:="optional"
Unresolved requirement: Require-Bundle: org.eclipse.mylyn.wikitext.core.ant; bundle-version="[2.9.0,3.0.0)"; resolution:="optional"
Unresolved requirement: Require-Bundle: org.eclipse.mylyn.wikitext.mediawiki.core.ant; bundle-version="[2.9.0,3.0.0)"; resolution:="optional"
Unresolved requirement: Require-Bundle: org.eclipse.mylyn.wikitext.mediawiki.core; bundle-version="[2.9.0,3.0.0)"; resolution:="optional"
Unresolved requirement: Require-Bundle: org.eclipse.ui.cheatsheets; bundle-version="[3.3.0,4.0.0)"
-> Bundle-SymbolicName: org.eclipse.ui.cheatsheets; bundle-version="3.5.0.v20160504-0839"; singleton:="true"
Unresolved requirement: Require-Bundle: org.eclipse.help.base; bundle-version="[4.0.0,5.0.0)"; resolution:="optional"
-> Bundle-SymbolicName: org.eclipse.help.base; bundle-version="4.1.2.v20170301-0400"; singleton:="true"
Unresolved requirement: Require-Bundle: org.apache.lucene.core; bundle-version="[3.5.0,4.0.0)"
Unresolved requirement: Import-Package: org.eclipse.equinox.http.jetty; resolution:="optional"
-> Export-Package: org.eclipse.equinox.http.jetty; bundle-symbolic-name="org.eclipse.equinox.http.jetty"; bundle-version="3.3.0.v20160324-1850"; version="1.3.0"
Unresolved requirement: Import-Package: org.eclipse.jetty.http; version="[9.0.0,10.0.0)"
Unresolved requirement: Require-Bundle: org.apache.lucene.analysis; bundle-version="[3.5.0,4.0.0)"
Unresolved requirement: Require-Bundle: org.eclipse.help.ui; bundle-version="[4.0.0,5.0.0)"; resolution:="optional"
-> Bundle-SymbolicName: org.eclipse.help.ui; bundle-version="4.0.200.v20160510-0758"; singleton:="true"
Unresolved requirement: Require-Bundle: org.eclipse.help.base; bundle-version="[4.0.0,5.0.0)"; visibility:="reexport"
Unresolved requirement: Require-Bundle: org.eclipse.ui; bundle-version="[3.6.0,4.0.0)"
Unresolved requirement: Require-Bundle: org.eclipse.ui.forms; bundle-version="[3.5.0,4.0.0)"
Unresolved requirement: Import-Package: org.eclipse.egit.core.internal.job; version="[4.9.0,4.10.0)"
-> Export-Package: org.eclipse.egit.core.internal.job; bundle-symbolic-name="org.eclipse.egit.core"; bundle-version="4.9.0.qualifier"; version="4.9.0"; x-friends:="org.eclipse.egit.ui,org.eclipse.egit.gitflow.ui,org.eclipse.egit.gitflow"
Unresolved requirement: Import-Package: org.eclipse.egit.core; version="[4.9.0,4.10.0)"
-> Export-Package: org.eclipse.egit.core; bundle-symbolic-name="org.eclipse.egit.core"; bundle-version="4.9.0.qualifier"; version="4.9.0"; x-friends:="org.eclipse.egit.ui,  org.eclipse.egit.ui.test,  org.eclipse.egit.mylyn.ui,  org.eclipse.egit.gitflow.test,  org.eclipse.egit.gitflow.ui"
Unresolved requirement: Import-Package: org.eclipse.egit.core.internal; version="[4.9.0,4.10.0)"
-> Export-Package: org.eclipse.egit.core.internal; bundle-symbolic-name="org.eclipse.egit.core"; bundle-version="4.9.0.qualifier"; version="4.9.0"; x-friends:="org.eclipse.egit.ui,org.eclipse.egit.import,org.eclipse.egit.gitflow.ui"
Unresolved requirement: Import-Package: org.eclipse.egit.core.synchronize; version="[4.9.0,4.10.0)"
-> Export-Package: org.eclipse.egit.core.synchronize; bundle-symbolic-name="org.eclipse.egit.core"; bundle-version="4.9.0.qualifier"; version="4.9.0"; x-friends:="org.eclipse.egit.ui,org.eclipse.egit.ui.test"
Unresolved requirement: Import-Package: org.apache.jasper.servlet; version="[0.0.0,8.0.0)"
Unresolved requirement: Import-Package: javax.servlet.jsp; version="[2.0.0,2.3.0)"
-> Export-Package: javax.servlet.jsp; bundle-symbolic-name="javax.servlet.jsp"; bundle-version="2.2.0.v201112011158"; version="2.2.0"
Unresolved requirement: Import-Package: javax.el; version="2.2.0"
-> Export-Package: org.eclipse.equinox.jsp.jasper; bundle-symbolic-name="org.eclipse.equinox.jsp.jasper"; bundle-version="1.0.500.v20150119-1358"; version="1.0.0"
Unresolved requirement: Require-Bundle: org.tukaani.xz; bundle-version="1.3.0"
Unresolved requirement: Import-Package: org.eclipse.equinox.p2.engine; version="[2.0.0,3.0.0)"
-> Export-Package: org.eclipse.equinox.p2.engine; bundle-symbolic-name="org.eclipse.equinox.p2.engine"; bundle-version="2.4.100.v20160419-0834"; version="2.2.0"
-> Export-Package: org.eclipse.equinox.internal.p2.metadata.repository.io; bundle-symbolic-name="org.eclipse.equinox.p2.metadata.repository"; bundle-version="1.2.300.v20160419-0834"; version="0.0.0"; x-friends:="org.eclipse.equinox.p2.engine"
Unresolved requirement: Import-Package: org.eclipse.equinox.p2.planner; version="[2.0.0,3.0.0)"
-> Export-Package: org.eclipse.equinox.p2.planner; bundle-symbolic-name="org.eclipse.equinox.p2.director"; bundle-version="2.3.300.v20160504-1450"; version="2.0.0"
Unresolved requirement: Import-Package: org.eclipse.equinox.p2.engine.query; version="[2.0.0,3.0.0)"
-> Export-Package: org.eclipse.equinox.p2.engine.query; bundle-symbolic-name="org.eclipse.equinox.p2.engine"; bundle-version="2.4.100.v20160419-0834"; version="2.0.0"
-> Export-Package: org.eclipse.equinox.internal.provisional.p2.director; bundle-symbolic-name="org.eclipse.equinox.p2.director"; bundle-version="2.3.300.v20160504-1450"; version="0.0.0"; x-friends:="org.eclipse.equinox.p2.console,  org.eclipse.equinox.p2.director.app,  org.eclipse.equinox.p2.operations,  org.eclipse.equinox.p2.ui.admin,  org.eclipse.equinox.p2.installer"
-> Export-Package: org.eclipse.equinox.internal.p2.director; bundle-symbolic-name="org.eclipse.equinox.p2.director"; bundle-version="2.3.300.v20160504-1450"; version="0.0.0"; x-friends:="org.eclipse.equinox.p2.operations,  org.eclipse.equinox.p2.repository.tools,  org.eclipse.pde.core,  org.eclipse.equinox.p2.reconciler.dropins,  org.eclipse.equinox.p2.ui,  org.eclipse.equinox.p2.director.app"
-> Export-Package: org.eclipse.equinox.internal.p2.engine; bundle-symbolic-name="org.eclipse.equinox.p2.engine"; bundle-version="2.4.100.v20160419-0834"; version="0.0.0"; x-friends:="org.eclipse.equinox.p2.garbagecollector,  org.eclipse.equinox.p2.repository.tools,  org.eclipse.equinox.p2.touchpoint.eclipse,  org.eclipse.equinox.p2.touchpoint.natives,  org.eclipse.equinox.p2.ui.sdk.scheduler,  org.eclipse.pde.build,  org.eclipse.equinox.p2.director.app"
-> Export-Package: org.eclipse.equinox.internal.p2.update; bundle-symbolic-name="org.eclipse.equinox.p2.touchpoint.eclipse"; bundle-version="2.1.400.v20160419-0834"; version="2.0.0"; x-friends:="org.eclipse.equinox.p2.reconciler.dropins,org.eclipse.equinox.p2.extensionlocation,org.eclipse.equinox.p2.directorywatcher"
Unresolved requirement: Import-Package: org.eclipse.equinox.p2.publisher.eclipse; resolution:="optional"
Unresolved requirement: Import-Package: org.eclipse.equinox.p2.engine.spi; version="[2.0.0,3.0.0)"
-> Export-Package: org.eclipse.equinox.p2.engine.spi; bundle-symbolic-name="org.eclipse.equinox.p2.engine"; bundle-version="2.4.100.v20160419-0834"; version="2.0.0"
Unresolved requirement: Import-Package: org.eclipse.equinox.p2.publisher; resolution:="optional"
-> Export-Package: org.eclipse.equinox.p2.publisher; bundle-symbolic-name="org.eclipse.equinox.p2.publisher"; bundle-version="1.4.100.v20160504-1450"; version="0.0.0"; x-friends:="org.eclipse.equinox.p2.directorywatcher,  org.eclipse.equinox.p2.touchpoint.eclipse,  org.eclipse.equinox.p2.updatesite,  org.eclipse.pde.publishing,  org.eclipse.equinox.p2.publisher.eclipse"
-> Export-Package: org.eclipse.equinox.internal.p2.artifact.repository; bundle-symbolic-name="org.eclipse.equinox.p2.artifact.repository"; bundle-version="1.1.500.v20160419-0834"; version="0.0.0"; x-friends:="org.eclipse.equinox.p2.publisher,  org.eclipse.equinox.p2.reconciler.dropins,  org.eclipse.equinox.p2.ui,  org.eclipse.equinox.p2.directorywatcher,  org.eclipse.equinox.p2.repository.tools,  org.eclipse.equinox.p2.publisher.eclipse"
Unresolved requirement: Import-Package: org.eclipse.equinox.p2.planner; version="[2.0.0,3.0.0)"; resolution:="optional"
-> Export-Package: org.eclipse.equinox.internal.p2.garbagecollector; bundle-symbolic-name="org.eclipse.equinox.p2.garbagecollector"; bundle-version="1.0.300.v20160504-1450"; version="0.0.0"; x-friends:="org.eclipse.equinox.p2.touchpoint.eclipse,org.eclipse.pde.core,org.eclipse.equinox.p2.ui.sdk.scheduler"
-> Bundle-SymbolicName: org.eclipse.equinox.p2.engine; bundle-version="2.4.100.v20160419-0834"; singleton:="true"
-> Export-Package: org.eclipse.equinox.internal.p2.artifact.repository.simple; bundle-symbolic-name="org.eclipse.equinox.p2.artifact.repository"; bundle-version="1.1.500.v20160419-0834"; version="0.0.0"; x-friends:="org.eclipse.equinox.p2.touchpoint.eclipse,  org.eclipse.equinox.p2.tests,  org.eclipse.equinox.p2.directorywatcher,  org.eclipse.equinox.p2.updatesite,  org.eclipse.equinox.p2.publisher,  org.eclipse.equinox.p2.extensionlocation,  org.eclipse.equinox.p2.repository.tools"
-> Export-Package: org.eclipse.equinox.internal.p2.metadata.repository; bundle-symbolic-name="org.eclipse.equinox.p2.metadata.repository"; bundle-version="1.2.300.v20160419-0834"; version="0.0.0"; x-friends:="org.eclipse.equinox.p2.engine,  org.eclipse.equinox.p2.publisher,  org.eclipse.equinox.p2.reconciler.dropins,  org.eclipse.equinox.p2.ui,  org.eclipse.equinox.p2.updatesite,  org.eclipse.equinox.p2.extensionlocation,  org.eclipse.equinox.p2.repository.tools,  org.eclipse.equinox.p2.publisher.eclipse"
What's set as your target platform? 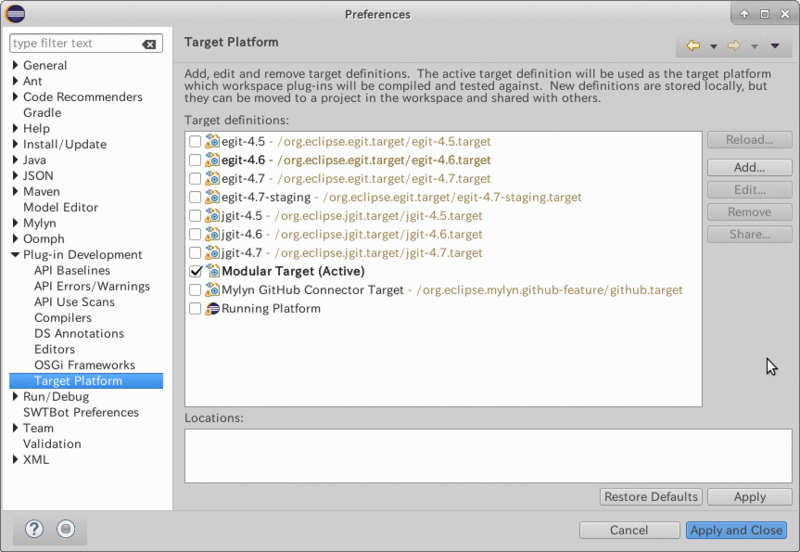 [Window]-[Preferences]-[Plug-in Development]-[Target Platform] is set to "Modular Target" (I have not changed this setting). That "Modular Target" also comes from oomph. Probably it's also not quite right. Try the egit-4.6 (Neon) or the egit-4.7 (Oxygen) target instead. More ideally, it would be used by the developers themselves and maintain to be correct. It's not that big a challenge. For Oomph we generate the *.target with annotations on the targlet, so we only need to maintain one thing and it remains correct. Sure, but that's not actually an improvement in behavior. I won't be able to pull EGit's setup into another workspace because *.target files can't be merged, unlike targlets. They don't ensure that workspace requirements are actually resolved, they don't use a shared bundle pool, so you'll have to download all the bundles into each workspace. But to each their own. At least something that works is better than something that doesn't. Yes, that's the case for our Oomph build is well, which is why for Oomph's development setup we generate a *.target file when resolving the targlet definition. And we often run our Maven build based on that *.target locally so that we can test the installation of what we've built before committing the changes.